The liturgy and worship at St Mary's combines Gregorian chant, Renaissance, Viennese and contemporary sacred music with the majestic language of the Book of Common Prayer. The ceremonial is rich and traditional. The church has been beautified by successive generations and remains strangely simple and peaceful, despite the gentle rumble of the trains underneath. The principal act of worship on Sundays and on Solemn Feast Days is a traditional High Mass (a form of the interim rite) but with significant concessions to Vatican II and using the BCP readings. It seeks to achieve spiritual excellence by combining carefully thought out and well-honed ceremonial with appropriately fitting music combining traditional liturgical plainsong with settings of the mass, anthems and motets from a wide range of composers, from all musical periods. The said Mass is a form of Common Worship. 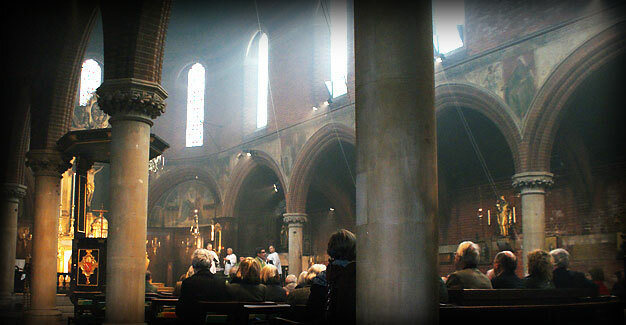 The parish upholds the instruction from the Bishop of London contained in his pastoral letter of All Saints’ Day 2011 to celebrate the mass according to the rites of the Church of England and only to supplement with material from the Roman rite for items for which no provision is made. There is a long-standing tradition of regularly inviting guest preachers with a wide range of backgrounds, including those from other denominations, in order to broaden the vision of the congregation. Those presenting for baptism and marriage represent a mobile inner city population and a flexible approach is maintained. The small number of children who attend are welcomed at the High Mass. The parish has recently re-established a Cell of the Society of our Lady of Walsingham. Additionally there is a bible study group led by members of the congregation and attended regularly by the Clergy, and a regular Lent course.